The structure and platform is a robust and adequate strength to sustain the respective and dynamic loads. LED display indicator Ip68 with lockable / with S.S. Protection box and thermal printer facility. The Printer has minimum 100 memories with accumulation of weighments of the particular individual, giving details of each weighment and the total weight of the weighment of that particular individual. 100 Over load protection and 200% impact load protection. 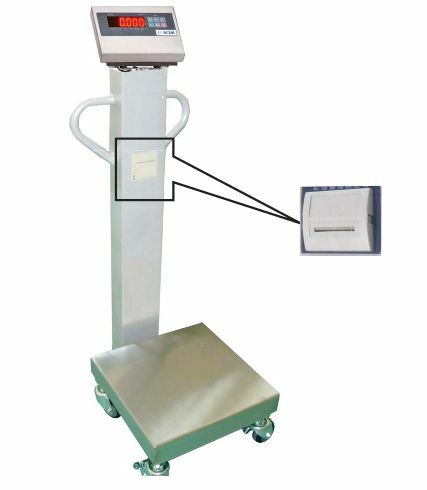 Total weighing scale is with trolley type with 6Nos. Rubber / fiber coated /bearing / wheels. Back hand rail with handle also provided. The scale has powder coated finish paint. Pan - SS Platter (304 Grade) with 2mm Thickness. Power supply - 100 to 250 volts switch mode power supply circuit board of weighing scale for low / high voltage. Load cell - IP 68 SS load cell (Ingress Protection) dust proof and resistant vonfirming to IS-9281 (I-IV parts), with OIML (International Organization of legal metrology) accuracy class. Battery backup & Charger : with rechargeable solar battery charger and charged for run of 12 to 15 hours backup (Battery will be 6 V 4.5 Ah sealed maintenance free).